Protective packaging has gained importance for its role in eliminating the incidences of physical damages to packaged goods during shipping process. Foam materials are being widely used for offering high-level protection to the packaged goods. Foam protective packaging solutions are being developed to meet the diverse packaging needs for a range of products. Companies providing foam protective packaging solutions are focused upon fabricating their products according to the container dimensions and package sizes. Moreover, several players in the global foam protective packaging market are offering prototypes and incorporating advanced design engineering technologies to facilitate utmost levels of corner protection, shock absorption, and edge protection. Plastifoam Company, Sonoco Products Company, Sealed Air Corporation, Pregis Corporation, Volk Packaging Corporation, DRB Packaging, Rogers Foam Corporation, Wisconsin Foam Products, Armstrong Brands, Inc., and Tucson Container Corporation are observed as global leaders in offering foam protective packaging to multiple industries. Transparency Market Research’s recently published forecast study observes that these companies will play a key role in instrumenting the growth of the global foam protective packaging market. 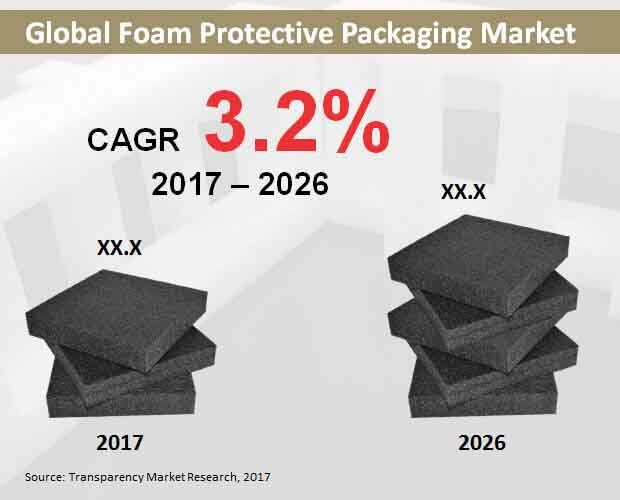 However, the report estimates that during the forecast period, 2017-2026, the global foam protective packaging market will expand at a sluggish CAGR of 3.2%, bringing in just over US$ 5.3 Bn in global revenues by the end of 2026. The report has addressed the key factors restraining the growth of the global foam protective packaging market. While the players in the global foam protective packaging market will be compelled to divest their capital in offering prototype sampling, part production and custom fabrication, there are several key restraints beyond their control that may curb their business growth to considerable extent. The use of foam materials in packaging is gradually witnessing a growing ban across several parts of the world. Ban of foam materials will ultimately cause complexities in raw material procurement for foam protective packaging companies. Environmental protection agencies are coercing market players to consider recycling and reusing of foam protective packaging products. This has spiked the operating costs of companies and lowered the profit margins. Catering to the diverse specifications of product packaging is a resolvable challenge, yet, entails a considerable expenditure on recalibration of production machineries and replacement of traditional protective packaging methods. The report has estimated that the demand for foam protective packaging products made of urethane materials will be the highest. By the end of 2026, urethane-based foam protective packaging products will bring in revenues worth over US$ 2 Bn. Neoprene foam materials will register fastest sales and reflect a CAGR of 4.6% over the forecast period. The report further reveals that the end-use of foam protective packaging products will be the largest in the e-commerce industry. Electronics and appliances, pharmaceutical and medical devices, and consumer product manufacturing are expected to represent leading end-user industry in the global foam protective packaging market. The report also reveals that in 2017, void fill and cushioning applications of foam protective packaging products will collectively bring in around US$ 2.2 Bn in terms of global revenues. The most lucrative marketplace for foam protective packaging is observed to the Asia-Pacific excluding Japan (APEJ) region. Manufacturing hubs like China, South Korea and India will factor the adoption of foam protective packaging in the APEJ region. By the end of 2026, the APEJ foam protective packaging market will have reach a valuation of US$ 2 Bn, accounting for more than one-third share of global market value.